Our Character Education curricula are research and evidence based… proven to produce results! Do you have a child on the way, already have little ones or are responsible to care for them in your profession? The next few minutes you spend reading this page can completely determine your aspirations of successfully raising a child. For many the thought of raising a child is filled with uncertainty – what to do about temper tantrums, biting and pinching. How can I teach my child to be caring, honest, and responsible? If you are a parent or early educator and appreciate a program that delivers on 1) tested guidelines and procedures 2) lessons that are uncomplicated and user-friendly 3) great ideas to make each day a meaningful part of the learning process? Then this is the program for you! How about a program that is easy to apply with concepts that your child is able to practice throughout the day? What if the program’s daily applications were expressly designed to be friendly for youngsters – making it thoroughly enjoyable for them to learn? Of course you want the program to have plenty of visual aids, ideas for interactive activities, simple to follow lesson plans, an abundance of suggestions and tips, and narratives with a music and story CD. If you answered, “yes” to any of the above then The Peaceful Solution Character Education Program, Early Learning For The Formative Years is for you. Designed by parents and teachers who understand the guiding principles of the Peaceful Solution Character Education Program, this early learner sets the groundwork for years to come. For parents and educators it is comforting to know that their efforts, started during the formative years, can be subsequently followed through on the same principles, with the same quality program, as your child securely grows with positive moral character. There is no better gift than to give a child a head start, a strong foundation, and a guiding hand to a life’s journey of living with positive moral character. 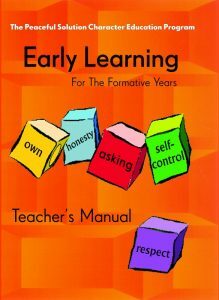 Teacher’s Manual with eight easy-to-follow lesson plans on the following topics: Character and Personality, the Rights of Ownership, Respect, the Importance of Asking, Self-Control, Honesty and Responsibility. Forty-four color discussion cards and flashcards to stimulate questions and discussions and develop thinking skills. They also serve as visual aids. CD filled with songs, poems and a narrative. 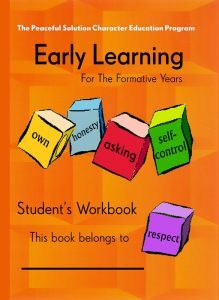 Student Workbook including creative hands-on activities for young students to complete.